Washing your windows consumes a too much time and energy? You can make a change now – simply contact our representatives and request our window cleaning in City of London. We will manage this matter for you and the final result will be ideal for each part of your windows – the glass, framework and sills. With our help, you will have the opportunity to do whatever you like with the time you normally spend for window cleaning. However, our services will give you even more, as you can witness from our list of advantages. We also provide our professional services in nearby areas: Covent Garden, Tower Hill, Blackfriars, Fenchurch Street, Fleet Street. You can be sure that the great look of your business property is guaranteed. The professionals will give you top-notch commercial window cleaning. With our water-fed extension pole system, you will witness fast and splendid washing of all windows all the way to the fourth floor. For taller buildings, we proceed with our rope access tools. It is our efficient technique of reaching glass panes on taller edifices. Regardless of what is the size of your business premise – a humble corner shop or the Shard – we will ensure great look of your windows. 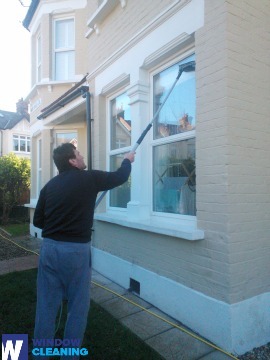 We provide domestic and business window cleaning by using efficient methods. You can rely on our expertise for all types of glass surfaces, roof windows and conservatories. For windows placed up to the fourth floor, we use water-fed extension poles. This technique is comfortable and allows risk-free cleaning procedures – the poles are attached to the water tank in the van. For high-rise window surfaces, our rope access team will grant you fast and great end results. You can benefit from these methods right now – just dial 020 3746 3113 and place an order! With our professionalism and technical proficiency, you can depend on us for residential and commercial window cleaning. Your home will look perfect after our services, it doesn't matter what kind of windows you have. We polish and wipe small, double or sash windows, French doors, patio doors and bay windows. Furthermore, we clean skylights, garden windows and conservatories. In other words, you can rely on us for flawless cleaning of your windows, including frames and sills. The experts of window cleaning in City of London will revive your dwelling. We provide excellent window cleaning services in City of London. Our routine includes water fed extension pole system and also jet washing. We protect your health and safety with eco-friendly cleaning solutions and purified water. Become part of our satisfied purchasers – dial 020 3746 3113 and get in touch with our customer service staff. You can also order our services online – just fill in our special form or use our chat facility.